Background Objective: Rapid urbanization in recent times has led to increase in heavy metal pollution. Human exposure to various environmental contaminants has increased tremendously over the years. This study investigated the effects of trace concentration of nickel on Nephrolepis exaltata and also determined its suitability as a bio-indicator of Ni in water body. Materials and Methods: Fifteen (15) Nephrolepis exaltata plants were exposed to increasing concentrations of nickel solutions (0.01, 0.1 and 1 ppm) and controls for sixty (60) days. The root, shoot and leaf lengths of the fern at 0, 30 and 60 days were measured. Determination of Leaf chemical contents were carried out as well as Chlorosis and necrosis examination. Results: The findings indicated that Nephrolepis exaltata showed increased root length only after 60 days of administering 0.01 ppm treatment; increased leaf length at day 60 upon treatments with 0.1 ppm and 0.01 ppm of Ni. Nephrolepis exaltata showed significant increase in chlorophyll production at low concentrations (0.1 ppm and 0.01 ppm). Visible signs of toxicity (Chlorosis, frond disconnection and necrosis) were seen in Nephrolepis exaltata only at higher concentration. Conclusion: This study revealed that Nephrolepis exaltata cannot be used as a bio-indicator of Nickel in the environment since it shows toxicity at ≥ 1 ppm. However, the study revealed little sensitivity of the Nephrolepis exaltata (Boston fern) to trace amounts of Ni metal. Rapid urbanization in recent times has led to increase in heavy metal pollution. Human exposure to various environmental contaminants has increased tremendously over the years. Significant amount of metals amasses in sediments and ultimately enter into the food chain through water, plants or leaching into underground water. Heavy metals, example of these environmental contaminants can also be considered as trace elements because of their presence in trace concentrations (ppb range to less than 10 ppm) in various environmental matrices . The maximum permissible concentration for metal ions according to the standards of the environmental regulations guidelines is about 1 ppm each. The total limit should not be more than 5 ppm. Nickel is an example of these contaminants, which when in excess, have been discovered to inhibit germination, chlorophyll production and proteins in plants . Also, several animal experimental studies have shown increased cancer incidence associated with chronic exposure to Nickel . Phyto-remediation, a recently adopted approach for the treatment of contaminated water and soils, is a cost-effective plant based approach of remediation. It is the use of plants to clean up heavy metals from the environment. Ferns belong to the lower vascular plant division Pteridophyta, having leaves usually with branching vein systems. They have the ability to accumulate and metabolize some heavy metals within their tissues [4,5]. The use of ferns to remove these heavy metals has been proven to be better than most conventional methods. Plants have been used as very sensitive tools for prediction and recognition of environmental stresses. Nephrolepis exaltata is a perennial plant; it is available in dry and wet seasons and capable of accumulating heavy biomass that can accommodate herbivores interaction. It is commonly called common sword fern while it is called "omu" in Yoruba . “Omu” can be used as an ecological indicator e.g., Asplenium bulbiferum (Mother Spleenwort), grows only near permanent running water, usually in or near waterfalls. Reginaldo reported that trace metal such as copper and nickel represent a relevant and important class of environmental pollutants, which can accumulate in the tissues of living organisms with consequent toxic effects. In this respect, several investigations have described the use of plants as bio-indicator organisms in eco-toxicological applications to assess the effects of heavy metals in polluted or disturbed environments. Bio-indicators are used in the determination of the biological effects of a single pollutant, the determination of the synergetic and antagonistic effects of multiple pollutants on an organism, and in the early recognition of pollutant damage to plants as well as toxic dangers to humans [7,8]. Therefore, one of the aims of carrying out this research work is to see if Nephrolepis exaltata can be used as a bio-indicator. Nephrolepis exaltata was collected from the bank of the Ariran River, flowing through Joseph Ayo Babalola University (Figure 1), which is located very close to the University’s main-generator house. Plant samples were obtained with the aid of a hand trowel (Figure 2). A sample of the polluted water was also collected for heavy metal analysis. 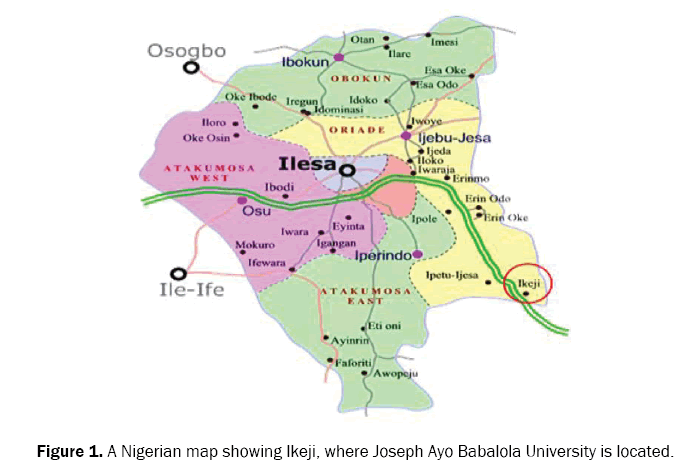 Figure 1: A Nigerian map showing Ikeji, where Joseph Ayo Babalola University is located. 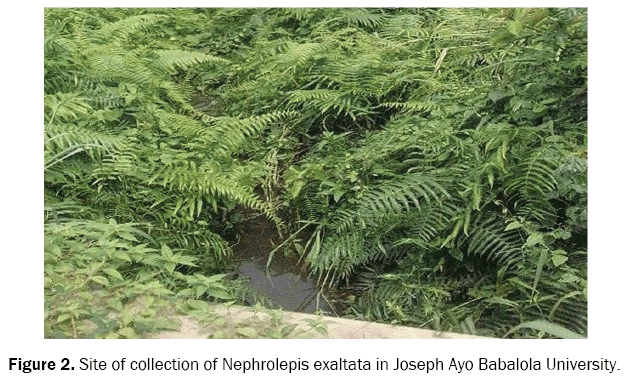 Figure 2: Site of collection of Nephrolepis exaltata in Joseph Ayo Babalola University. Nephrolepis exaltata collected was introduced into each of the 20 containers. The 20 containers which individually contained 3000 mL of the water sample collected from the river flowing through Joseph Ayo Babalola University were grouped into 4, giving rise to groups A, B, C, and G respectively. Group G consisted of the control and it had no heavy metal content. Ni was supplied as chloride salt to the plants (NiCl2.6H2O). Stock concentration was prepared. The concentrations introduced were in ppm and were diluted in 100 mL, 10 mL and 0 mL respectively. After the first 30 days, distilled water was used in place of the water sample from the sampling site. Before the exposure of the plants to prepared Nickel concentrations, the initial Nickel concentration in the plant was measured quantitatively using AAS method. The ferns were left to acclimatize for a period of 3 weeks. After acclimatization, fern length of the roots, shoots and leaves were measured so that there will be no significant difference between the groups before the introduction of Nickel into the hydroponic solutions. Observations for variations in length, and colour changes were also done at 30 days interval for a period of 60 days. 5 mL of growth enhancer (Plantzyme agricultural soluble fertilizer), which contained, N:P:K (5:1:50) was diluted in 5 L of deionized water and a 100 mL of the solution was added, every 30 days to the Nephrolepis exaltata in the 20 containers. All glassware/plastic ware were soaked in 1 M HNO3 for 24 hours, rinsed in deionised water followed by Barnstead E-pure® water prior to use. Nephrolepis exaltata collected was gently rinsed with distilled water to remove any form of soil remaining on the roots. Then, they were gently placed in the planting containers. Also the measurements of growth parameters- (Root length, shoot length, leaf length, wet weight, dry weight), were taken. Measurement of the biomass of Nephrolepis exaltata: Growth parameters which included the length of roots, the length of shoots, the length of the leaves, and colour were measured and noted, before the introduction of Nephrolepis exaltata into the hydroponic solutions, during and after its growth period. Vernier calipers were used to take the measurements of root, shoot and leaf length. Measurement of dry weight: A portion of the dry fern material was digested in a mixture of nitric (HNO3) and perchloric (HClO4) acids and diluted to 25 mL with Barnstead E-pure® water (18.2 m_cm–1; Barnstead/Thermolyne Corp., Dubuque, IA, USA) (Miller 1998). Extracts was analysed for various elements using a flame atomic absorption spectrometer (Buck AGP 170), Central Lab, in Federal University of Technology, Akure. A sample of the waste water was also collected for analysis. Standards and dilutions were prepared in 0.1 M HNO3 in order to account for any matrix effects. All glassware/plasticware was soaked in 1 M HNO3 for 24 h, rinsed in deionised water followed by Barnstead E-pure® water prior to use. Measurement of wet weight: 1 g of the fern sample was collected from each treatment group and used for chlorophyll content analysis. Leaf colour, chlorosis and necrosis examination: colour, Chlorosis and Necrosis was also done through visual examination of visible symptoms. The chemical parameters: Chlorophyll contents (Chlorophyll a, Chlorophyll b, Chlorophyll a+b determination was carried out using, UV/VIS spectrophotometer (Spectrum lab 22Pc). The leaf chemical content was analysed using Rowan’s method . Chlorophyll a, b and a+b was determined. The major function of chlorophyll is to absorb light and transfer the light energy into chemical energy for production of glucose and carbon dioxide. Since photosynthesis depends on the absorption of light by pigments in the leaf such as, chlorophyll a and chlorophyll b, hence chlorophyll content analysis. Post-planting operations: Measurement of growth parameters was the same as pre-planting operations. Measurement of Nephrolepis exaltata biomass: The root length, shoot length and leaf length were measured before, during and after 60 days of planting. These were done in triplicates and the mean was calculated. Determination of leaf chemical contents: The absorbance of the resultant solution was read at 649, 664 and 665 nm with a UV/VIS spectrophotometer (Spectrum lab 22Pc). Absorption of the extract was measured at 649, 664, and 665 nm and concentrations of chlorophyll a, b and a+b, were calculated with equations used by Rowan et al. (1989). The Procedure used for getting the chlorophyll content is a stated below: One gram (1 g) of wet leaf was weighed using the electronic weighing balance and transferred quantitatively into a graduated test tube that was later wrapped with aluminium foil to prevent sun radiation from penetrating into the tube. 10 ml of ethanol was added to extract the chlorophyll from the leaf. The arrangement was kept in a refrigerator at a temperature of 20°C for 24 hrs to complete the chlorophyll extraction. A UV/VIS spectrophotometer (Spectrum lab 22Pc) was used to measure the chlorophyll content. The UV/VIS spectrophotometer was calibrated to zero (0) by using ethanol as the blank. After calibration, the cuvette (containing the plant extract) was placed inside the UV spectrophotometer (Spectrum lab 22Pc) and the readings were taken. Meanwhile, this was done in triplicate and the mean value was taken for absorbance. The formulae used for calculating the chlorophyll contents are shown in Table 1. Table 1. Calculation of chlorophyll contents. Determination of metal uptake:The test protocols were derived from the standard for a 7-day growth inhibition period over 8 weeks. Fern growth was measured after seven days of exposure to different concentrations of each metal. For the purpose of this study, Ni was supplied as NiCl2.6H2O. 20 Nephrolepis exaltata fronds were gently placed in a transparent plastic container containing metal solution at different concentrations. The dose-response tests conditions were the same as during the cultivation. For statistical evaluation of the results, the program SPSS 17 was used. Analysis of variance (two-way ANOVA < 0.05) was carried out to test for significant differences with GenStat version 8.1.0.152 . The results showed differences between the control and the various groups for 60 days. The comparison of means was based on the method of (Fisher’s least significant difference ‘‘LSD’’ test). Duncan’s correlation coefficient (r, p < 0.05) was used to test the correlation among the plants. 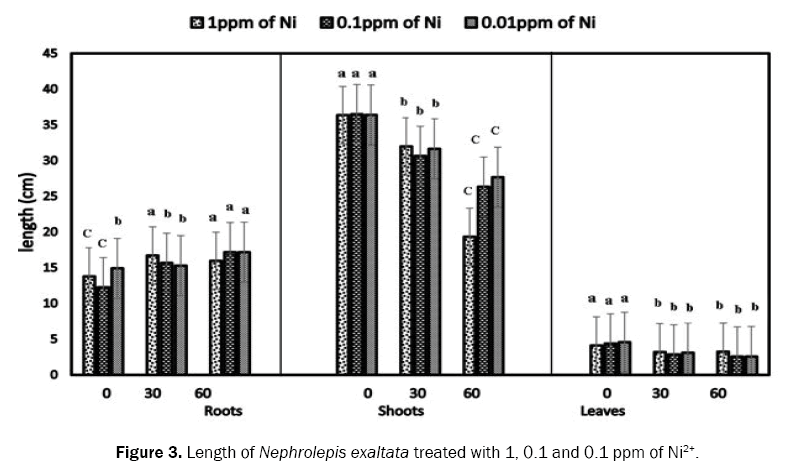 The growth response of Nephrolepis exaltata to nickel treatments shows the length of roots, shoots and leaves of each treatment of Ni on Nephrolepis exaltata from day 0 to day 60 (Figure 3). Nephrolepis exaltata was subjected to 1 ppm, 0.1 ppm and 0.01 ppm of Ni2+ treatments. Nephrolepis exaltata grown in treatment 1 ppm of Ni solution showed significant difference between the root growth at day 0 and day 60 (Figure 3). At 0.1 ppm, the fern showed a major increase in the length of its roots. The fern showed a slight increase in root length, when it was treated with 0.01 ppm of Nickel. The shoot length of Nephrolepis exaltata at 0.1 ppm and 0.01 ppm showed significant decrease at day 60 when they were compared to day 0. Nephrolepis exaltata treated in 1 ppm of Ni, had much more significant decrease in leaf length at day 60, when compared to day 0. At day 60, it was observed that the leaf length of Nephrolepis exaltata grown in 1 ppm of Ni, showed significant decrease in length. Nephrolepis exaltata treated with 0.01 ppm of Ni showed more significant decrease that other treatment. Figure 3: Length of Nephrolepis exaltata treated with 1, 0.1 and 0.1 ppm of Ni2+. Generally, at low concentrations (≤ 1 ppm), the roots of Nephrolepis exaltata showed high tolerance to Nickel treatments, and this result is supported by , who reported that, Lemna gibba tolerated nickel up to 0.5 ppm. The roots, shoots and the leaves varied in response to the different Ni treatments when compared to their number of days of treatments. The amount of Ni in ecosystem severely affected the growth and development of plants [12,13]. The problem of contamination of water and water pollution has intensified in recent times due to industrialization and urbanization . The toxic effect of Ni in plants includes decreased shoot growth and reduction in leaf area . Generally, in this study, all treatments except for 0.1 ppm of Ni and 0.01 ppm of Ni had negative effects on the chlorophyll content of Nephrolepis exaltata. This result is in sync with that of  whose work was on the topic, “Mannitol can mitigate negative effects of simulated acid mist and fluoranthene in juvenile Japanese red pine (P. densiflora Sieb. et Zucc.)”. He discovered that, damage to the evergreen plants was obvious in seedlings treated with acid mist alone and with acid mist plus fluoranthene, even after short exposure times. In this current study, only 0.1 ppm and 0.01 ppm of Ni showed a significant increase in chlorophyll content. An increase in chlorophyll content, when Nephrolepis exaltata was treated with 0.1 ppm and 0.01 ppm of Ni may be as a result of the help the fern might have received from the heavy metal introduction. Since the oxidation state of Ni is +2, it is possible that it may have substituted for the Mg atom in the chlorophyll molecule, which also has an oxidation state of +2, when the plant started undergoing any form of stress. It is also possible that Ni might have only increased the chlorophyll production, especially chlorophyll a. Results taken on day 0 and 60 for Chl. a+b and Chl. a/b are shown in Table 2 and Figure 4. The Chl. a+b content of Nephrolepis exaltata treated with 0.1 ppm showed a large significant increase after 60 days when compared to the control. The lower Chl. a+b and Chl. a/ Chl. b ratio in the mesophyll thylakoids of the Nephrolepis exaltata treated with concentrations of 1 ppm of Ni may be as a result of lower photosystem activity in Nephrolepis exaltata . Table 2. The Chlorophyll content- Chl. a, b, a+b and a/b (before and after) in Nephrolepis exaltata’s leaf samples. Note: Up and down arrows signify increase and decrease respectively. A: 1 ppm of Ni, B: 0.1 ppm of Ni, C: 0.01 ppm of Ni. Figure 4: Showing the difference in Chlorophyll content at Day 0 and Day 60. A: 1 ppm of Ni, B: 0.1 ppm of Ni, C: 0.01 ppm of Ni. Heavy metals have been discovered to cause visible symptoms to Ferns . In this research however, Nickel caused very minimal damage to Nephrolepis exaltata. Chlorosis and Necrosis were visible symptoms observed during and after 60 days of exposing them to different concentrations of Nickel. It caused visible damage to Nephrolepis exaltata at concentrations of 1 ppm, 0.1 ppm, and 0.01 ppm respectively (Figure 5). 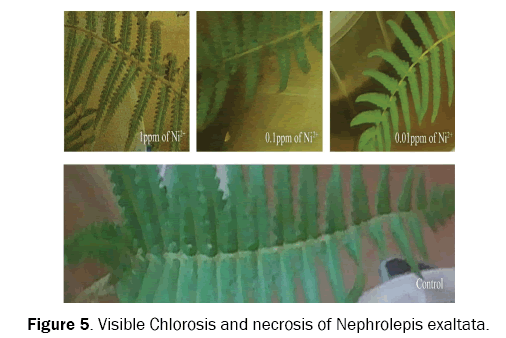 Chlorosis (a progression of green to yellow colour on the frond) and frond disconnection (detachment of fronds from colonies) were observed after 1-60 days of exposing Nephrolepis exaltata to Ni. Chlorosis may be due to deficiency of iron and may be produced by some heavy metals being taken by the plant . 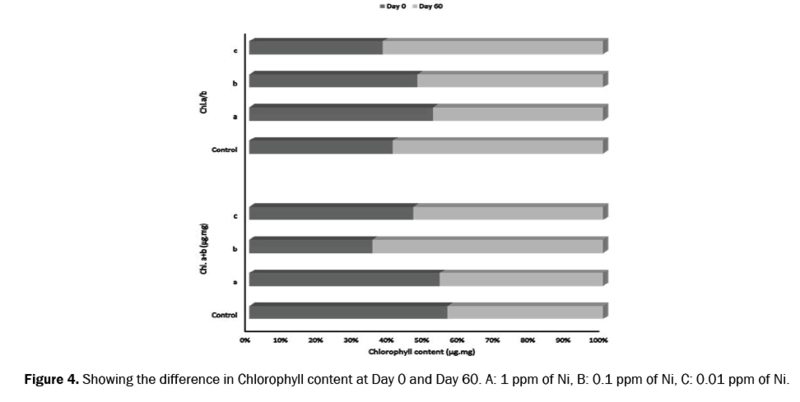 Ni was less toxic for the fern; however 1 ppm and 0.1 ppm of Ni in the culture medium respectively caused visible damage (Chlorosis and frond disconnection) after the 60 days treatment. This was more evident as other ferns in the same group had similar effects. Ferns grown in 1 ppm showed a little more chlorotic and necrotic effects than ferns grown in 0.1 ppm and 0.01 ppm respectively. The chlorotic effect of the fern grown in 1 ppm of Nickel is however shown in Figure 5. Ferns grown in 0.1 ppm showed more chlorotic effects than necrotic effects. However, the necrotic effect on some of the ferns grown in 0.1 ppm is also shown in Figure 5. Ferns shown in 0.01 ppm of Nickel only caused little effects on the fern. The In the study by , the symptoms illustrated in Figure 1 of the work, clearly showed that needles of the pine seedlings exposed to fluoranthene (FLU) and Phenanthrene (PHE) have a high degree of Chlorosis and reddish-brown necrosis compared with the control treatment. Figure 5: Visible Chlorosis and necrosis of Nephrolepis exaltata. The introduction of Ni treatments in the hydroponic solutions containing Nephrolepis exaltata ferns produced significant positive and negative effects on the growth of the fern. Nickel was more toxic to the fern at 1 ppm, and this is shown as seen in Figure 3 and Table 2. Both the roots and the leaves showed significant decreases in length. Nephrolepis exaltata showed significant increase in chlorophyll production at low concentrations (0.1 ppm and 0.01 ppm). However, visible signs of toxicity (Chlorosis, frond disconnection and necrosis) were seen in Nephrolepis exaltata, most especially, when it was grown in 1 ppm of Ni (Figure 5). As a result, Nephrolepis exaltata cannot be used as a bio-indicator of Nickel in the environment. This study has however shown that Nephrolepis exaltata (Boston fern) is sensitive to trace amounts of Ni pollutants. Further studies could also be carried out by increasing the concentration-strength of the Ni used. Other species of fern could be used as test-plants, instead of the specie, Nephrolepis exaltata for assessing the physiological responses of Nickel under hydroponic conditions. The study was self-funded through contribution from the research group and also assisted by the Management of the Joseph Ayo Babalola University, Ikeji-Arakeji Osun-State, Nigeria through the provision of reagents and equipment needed for the study. Therefore there great Contribution to this research work is highly acknowledged. This study discovered the deleterious effects of Nickel at increased concentrations (≥ 0.1 ppm) on Nephrolepis exaltata, as it exposes the toxic effect of Nickel on the leaf chemical content of the fern. The research revealed that Boston fern (Nephrolepis exaltata) could absorb trace amounts of Ni from polluted water, thereby through the food chain, increases the chances of the availability of potable drinking water, edible foods and reduces the spread of sickness and even, death of living organisms. Kabata-Pendia. Trace elements in soils and plants (3rd ed.). Boca Raton. 2009;203-209. Zhou X, et al. Effects of nickel, chromate, and arsenite on histone 3 lysine methylation. Toxicol Appl pharmacol. 2009;236:78-84. Arita A, et al. Epigenetics in metal carcinogenesis: Nickel, Arsenic, Chromium and Cadmium. Metallomics. 2009;1:222-228. Kamal M, et al. Phytoaccumulation of heavy metals by aquatic plants. Environ Int. 2004;29:1029-1039. Sabreen S, et al. Trade-off between cadmium tolerance and relative growth rate in 10 grass species. Environ Exp Bo. 2008;63:327-332. Oloyede F A, et al. Chemical, nutritional and anti-nutritional compositions of Nephrolepis exaltata (l.) Schott. (nephrolepidaceae) FUTA J Res Sci. 2014;10:252-257. Posthumus AC. Biological indicators of air pollution. In: Unsworth, M.H., Ormrod, D. P. (Eds. ), Effects of gaseous air pollution in agriculture and horticulture. Butterworth Scientific, London, 2012;27–42. Oguntimehin I, et al. Negative effects of fluoranthene on the ecophysiology of tomato plants (Lycopersicon esculentum Mill): Fluoranthene mists negatively affected tomato plants. Chemosphere. 2010;78:877-884. Rowan KS. Photosynthetic pigments of algae, xiii, 334p. Cambridge University Press, 1989. J Mar Biol Assoc UK. 1990;70:685. Payne RW. GenStat release 8 reference manual. (VSN International: Hamperdeen, UK). 2009. Khellaf N, et al. Growth response of the duckweed Lemna gibba L. to copper and nickel phytoaccumulation. Ecotoxicology. 2010;19:1363-1368. Oguntimehin I, et al. The use of Sunpatiens (Impatiens spp.) as a bioindicator of some simulated air pollutants–using an ornamental plant as bioindicator. Chemosphere. 2010:1;81(2):273-281. Yusuf M, et al. Protective response of 28-homobrassinolide in cultivars of Triticum aestivum with different levels of nickel. Arch Environ Contam Toxicol. 2011;60:68-76. Burger J. Bioindicators: types, development, and use in ecological assessment and research. Environmental Bioindicators. 2006;1:22-39. Fergusson JE. Heavy elements: chemistry, environmental impact and health effects. Pergamon. 1990. Henry RJ. An Overview of the phytoremediation of Lead and Mercury, United States Environmental Protection Agency Office of Solid Waste and Emergency Response Technology Innovation office, Washington, USA. 2009;1-9. Oguntimehin I, et al. Phytotoxicities of fluoranthene and phenanthrene deposited on needle surfaces of the evergreen conifer, Japanese red pine (Pinus densiflora Sieb. et Zucc.). Environ Pollut. 2008;154:264-271. L'Huillier L, et al. Nickel effects on two maize (Zea mays) cultivars: growth, structure, Ni concentration, and localization. Can J Bot. 1996;74:1547-1554.